Support is most split for the amendment that gives legislators more control over filling judicial vacancies. HIGH POINT, N.C., Sept. 21, 2018 – A recent High Point University/News and Record Poll finds that majorities (62 percent) of North Carolinians say they are more likely to vote in this year’s election knowing about the chance to vote for or against state Constitutional amendments. A little less than one-third (28 percent) said that it would make no difference. While about 1 in 5 (17 percent) North Carolinians have heard a lot about the new amendments that have been proposed and will appear on the November 2018 ballot, almost half of the survey respondents (47 percent) have heard at least a little about these proposed state amendments. About one-third (30 percent) say they have heard nothing at all. 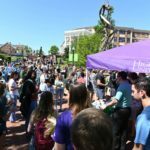 The HPU Poll also asked North Carolinians if they would vote for or against the six proposed state Constitutional amendments on the 2018 ballot. Most of the amendments received majority support. 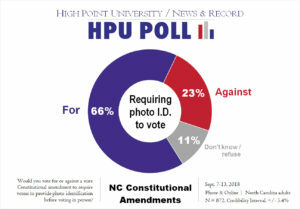 When asked if they would vote for or against a state Constitutional amendment to require voters to provide photo identification before voting in person, the HPU Poll found that about two-thirds (66 percent) would vote for this amendment. Twenty-three percent would vote against, and 11 percent didn’t offer an opinion. A majority (64 percent) of survey respondents would vote for a state Constitutional amendment to reduce the income tax rate in North Carolina to a maximum allowable rate of 7 percent. Twenty percent of those surveyed would vote against this amendment, and 16 percent didn’t offer an opinion. More than three-quarters (77 percent) of HPU Poll respondents would vote for a state Constitutional amendment to strengthen protections for victims of crime, to establish certain absolute basic rights for victims, and to ensure the enforcement of these rights. Nine percent would vote against this amendment. When deciding how to vote in November, 66 percent of HPU Poll participants said that they would vote for a state Constitutional amendment protecting the right of the people to hunt, fish and harvest wildlife. Seventeen percent of those surveyed would vote against this amendment, and 17 percent didn’t offer an opinion. Half of survey respondents would vote for a state Constitutional amendment to establish an eight member Bipartisan Board of Ethics and Elections Enforcement in the Constitution to administer ethics and elections law. Only 20 percent said they would vote against such an amendment and 31 percent did not know or offer an opinion. 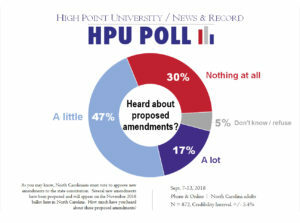 Finally, HPU Poll participants were split on how they would vote on a Constitutional amendment that gives legislators more control over filling judicial vacancies that are now nearly always decided by governors. Responses were split into thirds, with 36 percent saying they would vote for and 32 percent voting against such an amendment. Thirty-one percent didn’t know or offered no opinion. As you may know, North Carolinians must vote to approve new amendments to the state constitution. Several new amendments have been proposed and will appear on the November 2018 ballot here in North Carolina. How much have you heard about these proposed amendments? 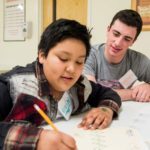 Does knowing there will be chances to vote for or against state Constitutional amendments make you more or less likely to vote in this year’s elections? Would you vote for or against a state Constitutional amendment to require voters to provide photo identification before voting in person? Would you vote for or against a state Constitutional amendment with this text? I know it is long, so let me know if you would like me to read it again. Would you vote for or against a state Constitutional amendment to reduce the income tax rate in North Carolina to a maximum allowable rate of seven percent (7%)? Would you vote for or against a state Constitutional amendment protecting the right of the people to hunt, fish, and harvest wildlife? Would you vote for or against a state Constitutional amendment to strengthen protections for victims of crime; to establish certain absolute basic rights for victims; and to ensure the enforcement of these rights? Would you vote for or against a state Constitutional amendment to establish an eight member Bipartisan Board of Ethics and Elections Enforcement in the Constitution to administer ethics and elections law? 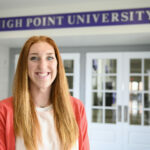 The most recent HPU Poll was fielded by live interviewers at the High Point University Survey Research Center calling on Sept. 7-13, 2018 and an online survey fielded at the same time. The responses from a sample of all North Carolina counties came from 827 adults interviewed online (606 respondents) as well as landline or cellular telephones (221 respondents). The registered voter subsample relied on responses from the participants about their own registration status and yielded a total of 734 respondents. The Survey Research Center contracted with Survey Sampling International to acquire these samples, and fielded the online survey using its Qualtrics platform. This is a combined sample of live phone interviews and online interviews. The online sampling is from a panel of respondents, so their participation does not adhere to usual assumptions associated with random selection. Therefore, it is not appropriate to assign a classical margin of sampling error for the results. In this case, the SRC provides a credibility interval of plus or minus 5.4 percentage points to account for a traditional 95 percent confidence interval for the estimates (plus or minus 3.4 percentage points) and a design effect of 1.6 (based on the weighting). The data is weighted toward population estimates for age, gender, race, and education level based on U.S. Census numbers for North Carolina. Factors such as question wording and other methodological choices in conducting survey research can introduce additional error into the findings of opinion polls. Details from this survey are available at http://www.highpoint.edu/src/files/2018/09/60memoC.pdf.